The most successful nation in the history of the Winter Olympics, Norway, has regained its lead on the medals table after 12 competition days at the Sochi Games. 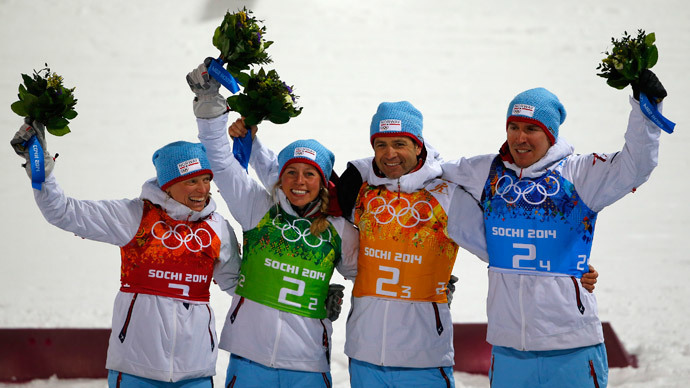 The country now has nine golds, after wins in cross-country skiing and biathlon team events. Yesterday’s table topper, Germany, slipped to second place with eight golds. Team USA is just one gold medal behind them. The Sochi 2014 gold medal in the men’s parallel giant slalom event went to Russian snowboarder Vic Wild. He beat Nevin Galmarini of Switzerland by 2.14 seconds after two runs in the big final. This is the first Olympic gold for the 27-year-old athlete, who was born in the US and took up Russian citizenship in 2011. Switzerland’s Patrizia Kummer claimed gold in the women’s final, with 7.32 seconds separating the Swiss athlete from the silver medalist, Japan’s Tomoka Takeuchi. Alpine skier Ted Ligety raced to an Olympic gold in the men’s giant slalom event at the Sochi Winter Games. The Norwegian women’s cross-country skiing squad raced to a gold medal in the team sprint classic. The win saw Marit Bjoergen, Norway’s anchor in the race, become a five-time Olympic champion. Finland’s cross-country skiers triumphed in the men's team sprint classic at the Sochi Games. The Finns raced to gold with a time of 23:14.89 minutes in the final at the Laura Center. Speed skater Martina Sablikova claimed the gold medal in the women’s 5000-meter event at the Sochi Games. Norway’s biathlon squad cruised to its first ever Olympic gold medal in the 2x6 km women's and 2x7.5 km men's mixed relay event at the Sochi Games. The most successful nation in the history of the Winter Olympics, Norway, has regained its lead on the medals table after 12 competition days at the Sochi Games. The country now has nine golds, after impressive wins in cross-country skiing and biathlon team events. Kaillie Humphries and Heather Moyse of Canada have become golden girls in the women’s bobsleigh event at the Sochi Winter Games.